(Source: I received a digital copy of this book for free on a read-to-review basis. Thanks to HarperCollins and Edelweiss. )This was an alright story, but it wasn’t what I was expecting.This series for me keeps going off in very different directions with each book, and this book was once again different to the 2 before it. While the first was a survival story, and the second about moving on, this one was more about human nature, and the way things developed with regards to money and how one person once again wanted to be in charge and have power over others.The characters in this were okay, and I felt quite sorry for Esther at times. She came across as quite a nice person, who wanted to do what was in everybody’s best interests, but she was fighting an uphill battle really. Gideon turned into a not-nice person, and I wasn’t impressed with his methods. The storyline in this was okay, but once again, it went in a very different direction to what I expected. I can’t really say that reading about people discussing pieces of green glass (their currency), people playing God, and killing people, to be all that exciting unfortunately, and after the half-way mark this story really dragged. There were also quite a few deaths in this book, some of them unexpected and fairly brutal! It seems like no-one is safe in this series!The ending to this was good, and it was quite a positive ending. This book just wasn’t what I expected though.Overall; okay story, but not quite what I was expecting,6.5 out of 10. As much as I loved the first two books (Kinda) It was all this romance! and there was also a lot of 'This person is here, now this one is there! Oh but wait! Look over here!' It seemed almost like the author was just trying to make a third book, not to wright it, but just so the series can become a trilogy, I'm sorry but this book was sadly, chaotic, hard to follow, over-dramatic, detailed in the wrong spots, and RUSHED! As strongly as I would recommend the other two books, I would not recommend this one. 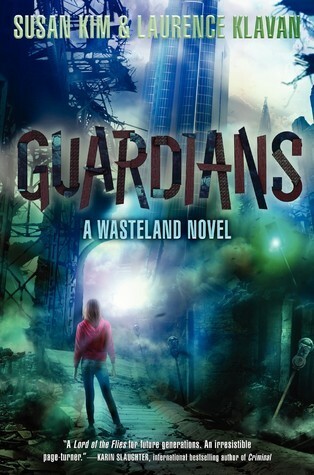 3.5 Stars'Guardians' is the gripping final book in the young adult dystopian Wasteland Trilogy. Esther, her friends, and her newest allies have created a safe place to call home in an old skyscraper in what was once Montreal. At their home, they have a garden on the rooftop so they can grow their own food and no longer have to worry about starving. The downside to this post-apocalyptic haven they've created is the Outsiders - groups of kids and teens that rule the street of the city and survive mainly by stealing or scavenging. There's also the toxic rain that everyone has to worry about - it kills anyone over the age of nineteen. The bands outside the District's walls are becoming more dangerous, and with Gideon gaining power over the outsiders, a real threat is looming over them all and it's just a matter of time before it's unleashed. It's up to Esther to save the others from themselves, before everyone and everything they've worked so hard to create is destroyed.This was a solid final installment in a gripping dystopian trilogy that always had me reading as fast as I could to see what was going to happen next. There continues to be a ton of action in the book, so you never quite know what to expect. The plot was well done with a fast pace and lots of action. The world that was created in the book was incredibly detailed and vivid with imagery, so much so that I could easily envision it in my mind. The one thing that always got to me and pulled me out of the thrall of the book was the age of the characters. This happened with every book in the series. The characters all act and seem so much older than they really are - it always shocked me when I was reminded that they were only kids. Again, I understand why the authors wrote the plot this way, it fits with the whole dystopian atmosphere that the story takes place in. I couldn't really wrap my mind around the age of the characters and the way they acted and lived.The plot was thrilling and full of tense moments and exciting twists. Being a dystopian book, not all of these were positive. Actually - the majority of them weren't. The book was well written with an intense storyline full of twists and turns, and definitely had me turning the pages to see what would happen next. Overall, I think this was a great final book in a series that grasps the reader at the beginning and doesn't let go until the very end. Definitely recommended for fans of science fiction and dystopias, as well as those who enjoy action and adventure.Disclosure: I received a copy of the book in exchange for an honest review. I did not read the first two books in the series, but i did not let that stop me from reading this last book without reading the first two. However I felt like I was missing something, so I had to go online to get a quick back story and character descriptions. After that I was able to get back into the story with no problem. I enjoyed the dystopian world created and thought it was well developed. The characters were okay the only one I thought was well developed was the main girl Esther, the other characters felt like they were lacking in realistically. I found the plot fast paced and rousing and it came to a nice conclusion for the series. I plan on reading the first two books in the series after reading this one because I enjoyed the book. I would recommend this book series to anyone who enjoys YA and/or dystopians. For more Book Reviews and to Enter GIVEAWAYS CLICK THIS! This was a solid ending to the trilogy. The only thing I take issue with is how the disease is conveniently handled in the end. If it had been that easy to inoculate people, then the disease would have never devastated the world. It feels like the authors weren't sure how to handle this aspect of the story. It also would have been nice to understand what happened to the environment. The disease did not cause that nor the earthquakes. Overall, it was an enjoyable read, but some of the story lacked forethought. Some of the characters were not well developed, nor was the world. I read reviews of the first book, and it sounds like the writing has improved since then, so I don't think I'll go back and read those. The timeline was off as well, sometimes the characters said "weeks passed" then said "that was days ago". I listened to the audio version. She did a good job reading it, and it was interesting enough that I finished it, though I found the lessons learned by characters really basic and spelled out for you. I thought the book "Guardians" was good. The main character Esther is a teenager who is trying to survive with her other friends in the wasteland but experiences trouble. The book has many dramatic twists and turns as well as conflict that makes the book a page turner. The book Guardians is a good book for people who like to read books that include survival and drama. *Somewhat similar to Insurgent and Divergent. I love this series, it is a simple idea retold in a very creative way and is so detailed that it actually make me lived through it and connect with the characters. Although this last installment felt a little rushed I still enjoy it. Esther's journey is about survival in a crazy world but also about hope and new beginnings. The conclusion to this young adult, post apocalyptic dystopian novel moved at a very fast pace!It has been a roller coaster ride for Esther and her band of friends. These children showed that anything can be accomplished with hard work, team work, persistence, patience and Interpersonal intelligence!! Worst entry in a frustrating series. So many of the obstacles were irritating for me to read, it put me on edge, not in a good way. The antagonists were all painfully similar. Did not enjoy, only finished out of obligation for the series. Susan Kim Laurence Klavan - Susan Kim & Laurence Klavan cowrote the graphic novels City of Spies and Brain Camp. Susan is also a five-time Emmy nominee for her work in children's television and a Writers Guild Award winner for best documentary. She wrote the stage adaptation of Amy Tan's The Joy Luck Club, teaches writing at Goddard College, and is a blogger for the Huffington Post. When Susan was little, her family spent a lot of time on the road. Susan enjoyed it, but it made her anxious. In Wanderers, Susan explores her worst fears about being far from home and having to rely on people you don't even know, much less trust.